NEW EDITION COMING SOON ! After the first year of publication, the Cognitive Horse has found the way throughout the world, inspiring the life of many human being and the possibility to dive deeper in the intriguing world of horses, their world, their life, their perception and own search for growth and experiences. In a few months there will be a reprint, which will include more photo-material, and which will become available in a wide distribution network. So get ready, the Cognitive Horse will be everywhere ! An intense book, for an intense journey, that doesn’t talk just about horses, but also about other animals, about us; human animals, about passion, about adventures, about new insights, about a different way of co-existence, about ethical choices, about a changing perspective that comes from the future. 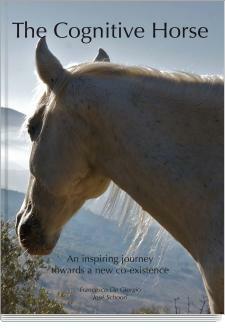 A book dedication to share our message, and to give insight in the possibilities to change our coexistence with horses, our coexistence with other animals, and human-animals as well, and to find your own journey of inspiration ! In a couple of months, the new edition will be available. If you want to be informed about the release-date, write us: info@learning-animals.org. I have a question about the book. Is it also released in dutch?And if yes can you give me a link to it? Thank you for your message. At the moment it is not translated in Dutch, as the topic is universal, and we find it important for people to start sharing a language worldwide. ANd yes, reading it with a dictionary will definitely be a good way to really elaborate the message! For Dutch people we do have many possibilities to learn more about The Cognitive Horse, you can check our website: http://www.learning-animals.org.